From Hamilton Countyâ€™s smallest community comes one of the biggest solar-power solutions to light up the renewable energy industry in modern times thanks to the Atlanta, Indiana-based Inventive Research Company. 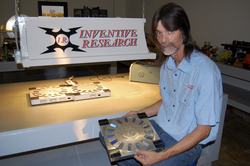 Inventive Researchâ€™s Jason Oliver is credited with developing the patent-pending process to obtain and generate alternating current AC power directly from solar cells through the companyâ€™s AC Solar Generator, which works on the same principle as existing generators. It is the AC Solar Generator that has caught the interest of a number of companies who would like to develop the product for large-scale use. When commercialized, the AC Solar Generator is expected to not only revolutionize how solar power is generated but could make it practical to input solar power into the grid system competitively and profitably. Oliverâ€™s patent-pending AC solar process is simple. He arrayed solar cells in a circular pattern. Above them is a spinning disc with slots that alternatively allow light to shine on the panels to produce an AC waveform. The resulting voltage produced is sinusoidal or AC that can be configured to three-phase power usable with the national power grid. Not only did the researchers figure out how to successfully and consistently generate AC power, they also developed and patented a sensing technology to match the phase of the power from the AC Solar Generator to the phase of the power grid. â€œPractical, applicable and revolutionary, best describes our AC Solar Generator,â€ says Researcher Jason Oliver, who believes this product can bring about enormous power savings during peak daylight hours. â€œMany years of research, testing and ultimately, successful application has brought about the very real possibility of affordable, clean and renewable energy to our fingertips now. â€The AC Solar Generator is also a candidate for General Electricâ€™s 2010 Ecomagination Challenge, a competition that awards funding to projects designed to improve energy use.For more information on Inventive Researchâ€™s novel way to generate alternating current from solar panels go to: acsolargenerator.com. via New AC Solar Generator Invention Could Revolutionize Solar Power Production.